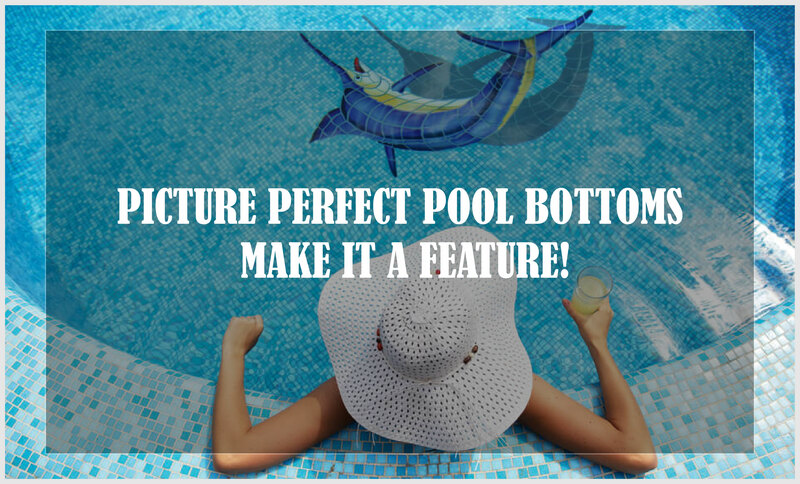 The bottom of your pool has the largest influence on how your pool looks. Yes, the walls can make a difference, but we rarely look at the sides directly, and the light hits them at an angle, which minimises the effects of refraction. But the pool floor, that’s what you see when you look into the water, so you need to give it careful thought and attention. Most people opt for the standard concrete floor, or maybe some kind of tile. This is fine, but it can be pretty boring, and everyone is doing it. If you want to stay on the fringes without doing anything too fancy and drastic (or expensive), you can make a simple change. Concrete is made using cement, sand, and gravel, so ask your pool builder to use tinted cement to give your concrete some colour. However, if you really want your pool floor to have some impact, consider giving your pool floor more vibrancy using beadcrete or quartzon. Beadcrete gives your pool floor a speckled appearance and comes in 54 different colour tones. Its colours are selected specifically for their reflective quality, and they work equally well in sunlight and night-time lighting. Beadcrete is made using bead-shaped spherical particles of modified aggregate cement polymer. 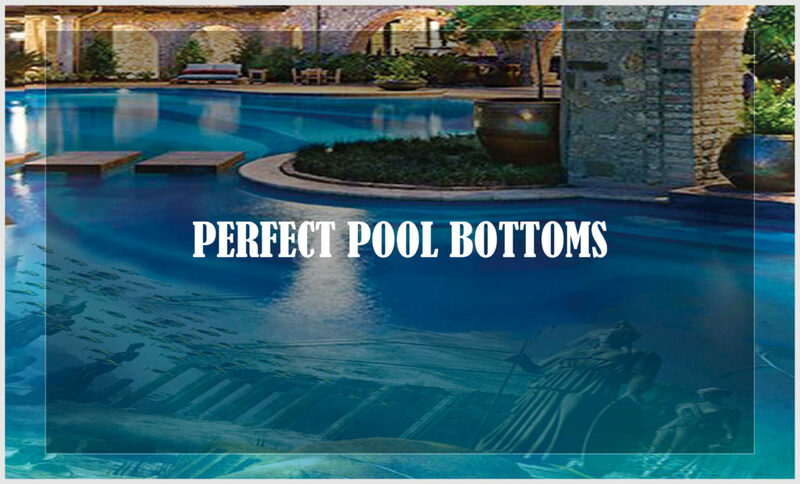 The finish product has a smooth, non-slip surface that sparkles as it refracts through your pool water. It doesn’t stain, and it doesn’t leach colour, so it lowers your pool maintenance needs, and can even reduce the amount of pool chemicals you use. Alternatively, try quartzon, a mix of sand and white cement that comes in 10 colours. Quartzon particles have different sizes, but they are compacted to form a smooth, rock-hard shimmering surface. Other ingredients include metal oxides, white quartz, and aggregate cement coated with ceramics. It’s a slip-free, easy-to-clean surface. Some pool owners prefer to have a stronger tactile experience when their feet touch the surface of their pools. Concrete – popular as it is – can be rough on your skin and can cause scrapes and bruises, so you might want something a little ‘softer’. There are multiple options along the spectrum from rough concrete to super-smooth tile. Micro pebble is the finest option, with each individual particle measuring 1mm to 2mm in diameter. The next step over is river granule at 2mm to 3mm. It has a smooth finish and has to be laid by hand. Then there’s pebblecrete, measuring 3mm to 4mm a piece. Another option is New Zealand white pebble. All these finishes use natural, reflective pebbles used to create a textured surface that is pleasant to the touch without being abrasive. They can be sprayed on, and when they dry, they harden into a lustrous plaster that doesn’t etch, cleans easily, and is resistant to bacteria, stains, and leaks because the mixture is non-porous. Using fibreglass shells for swimming pools is becoming a popular choice. It’s anecdotally thought to retain temperature better than other pool types, whether we’re talking about atmospheric temperature or the effects of pool heating. Fibreglass floors are smooth without being slippery, but their temperature retention makes them cooler on your feet than other pool floor materials. Fibreglass resists bacteria, so it lowers your maintenance requirements, including pool chemical volume and manual pool brushing. However, if your pool cover is fibreglass, it will let in more sunlight and can encourage algae growth, so even if the floor is fibreglass, pick something opaque. Fibreglass shells are moulded in a factory, so you may be restricted on shape and size, but you have a wider variety of colours, ranging from plain to mottled and shimmering. The most common varieties are greens, blues, blacks, and greys with exotic names like Mediterranean Aquamarine and Electric Grey Shimmer. There are sandy tones too. Coloured tile can be used to create elaborate mosaics on the floor of your pool. These tiles can be natural or artificial, but make sure you have them finished in a way that makes them less slippery. You should also pick a finish that won’t wash off, since they’ll permanently be underwater. The main varieties of tile are glass, ceramic, porcelain, and natural stone. Stone tiles include marble, limestone, travertine, slate, and granite. They fit well with salt-water pools, mineral pools, or designs that lean more towards natural ponds. Such pools are designed with rock-work, waterfalls, palm trees, and lighting that imitates tropical lagoons and grottos. It looks less like a pool and more like a magical cavern. Glass tile gives a cleaner, more modern look, especially if it’s complimented with infinity edges and glass balustrades. It’s discourages bacterial growth, and won’t stain or erode, so you don’t have to resurface it. It needs a lot less cleaning than any other pool floor material. Porcelain tiles are similar to ceramics in appearance and care requirements.